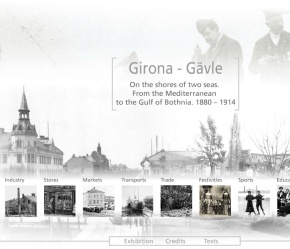 "Girona – Gävle: On the shores of two seas. From the Mediterranean to the Gulf of Bothnia. 1880-1914"
The aim of this exhibition is to show the different European cultural identities through the analysis of photographs from both cities in this period. The Centre for Image Research and Diffusion (CRDI, abbreviated in Catalan) of the Girona City Council, as part of the celebration of World Day for Audiovisual Heritage, inaugurates the Photography Museum of Girona (MFGi, abbreviated in Catalan), a new virtual museum available through mobile devices (iPhone and iPad) and through the website. This museum has the aim to exhibit the most representative images of Girona Photography History. From now you can visit the first gallery, devoted to the work of the photographer Josep Buil Mayral (Girona, 1920 - Eivissa, 2005). As part of the celebration events of the World Day for Audiovisual Heritage, the Girona City Council through the Cinema Museum and with the collaboration of the Centre for Image Research and Diffusion (CRDI, abbreviated in Catalan) presents the audiovisual series “The light of cinema” through The Audiovisual Heritage website: http://www.girona.cat/sgdap/cat/CRDI_Cronologies/angles/index.html These series consists of 28 short clips about the history of pre-cinema. They show how the original devices, all them from the museum collection, work. Another event for the World Day is the dramatized reading of texts by the writer Josep Pla that evoke different places of the city. The reading will be accompanied by the screening of a selection of images from the period.